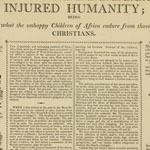 Antislavery opinion spread in the latter days of the revolution, driven by the many published appeals to popular religion, rationalist ideas of the rights of man, and revolutionary rhetoric equating the status of the colonies under British rule with slavery. In 1780 the radical Pennsylvania Congress passed the Gradual Emancipation Act, which, in spite of the self-congratulatory rhetoric, freed no one and was designed to minimally discomfort slaveholders. Under the act, all slaves born after March 1, 1780 would be free—at age twenty-eight. All slaves were to be registered, giving their date of birth. Any unregistered slave would become free. 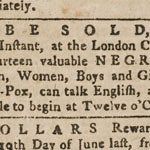 Slaves could not be imported, nor sold out of state. Slaves brought into the state would become free after six months, though prior to the six month limit masters could indenture them for several years. Blacks paid close attention to the law and used it to their advantage. Many masters simply refused or failed to register slaves, and those slaves appealed to authorities and became free. Some masters from out of state ignored the six months provision, only to have local blacks inform their slaves of their freedom six months and a day later. And free blacks were helpful in encouraging and sheltering runaways. Black agitation and growing antislavery sentiment among many whites made slaveholding increasingly problematic and unprofitable, and many blacks, with the aid of white allies, negotiated their own indentures to attain a state of semi-freedom on their own terms. The impact of the black and white antislavery activism inspired by the Gradual Emancipation Act was profound. In 1780 there were about 6,855 slaves in the state, with some 539 in Philadelphia County. Ten years later there were about 3,760 slaves in the state and 301 in Philadelphia. By the century’s end, slavery was all but dead in Philadelphia, though it would linger in the state in ever declining numbers up to about 1847. 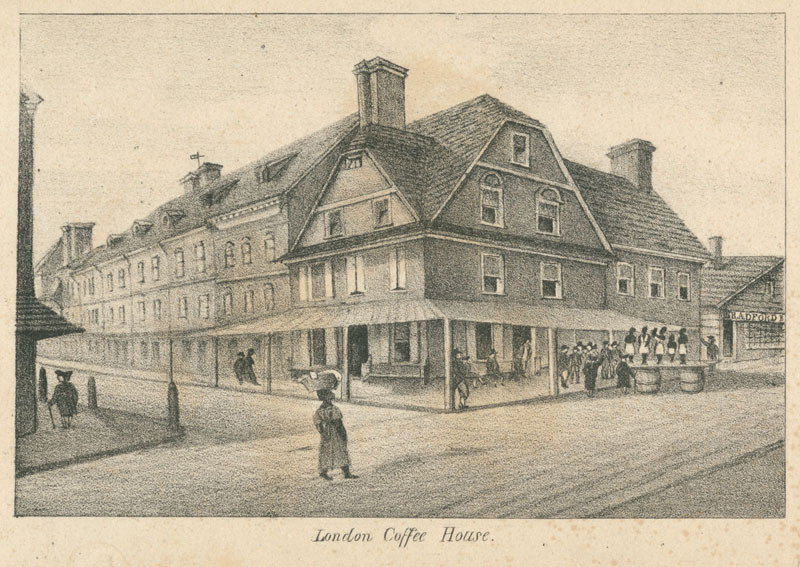 London Coffee House, lithograph by W. L. Breton (Philadelphia, 1830), showing slave auction, with advertisement. 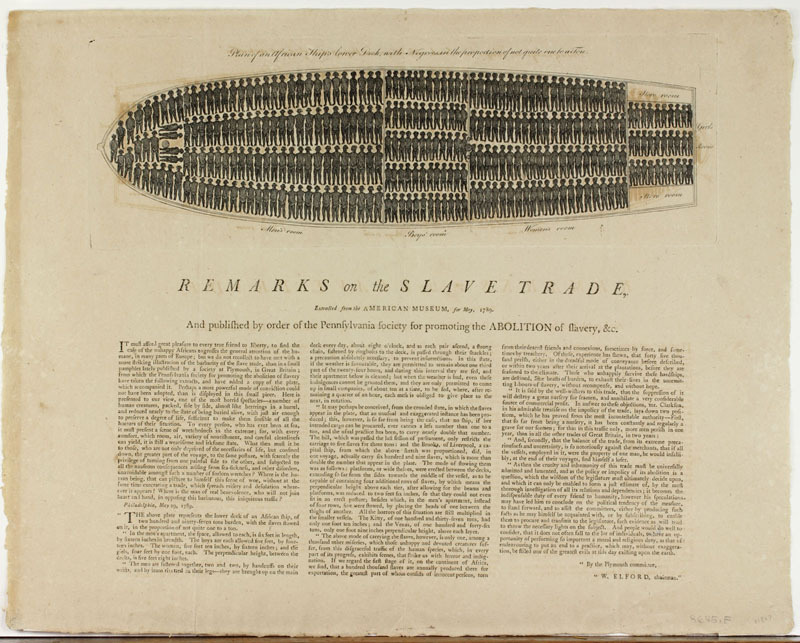 The United States officially abolished the transatlantic slave trade as of January 1, 1808, following abolition by Great Britain in the spring of 1807. Hailed as an act of disinterested philanthropy, abolition actually accommodated slaveholders and served their best interests. The United States Constitution banned any action against the trade for twenty years, giving slaveholders ample time to prepare. The preceding century of slave insurrections, particularly the Haitian Revolution, demonstrated the danger of a large population of rebellious Africans and the virtues of relying on a native-born slave population. Also, several slave states had excess slaves and banning further importation raised their value on the internal slave market. But an international antislavery movement could also take credit. Through the late 18th century, particularly after the American Revolution, abolitionists in Great Britain, France, and the United States engaged in vigorous antislavery pamphlet war and a steady flow of antislavery literature criss-crossed the Atlantic. 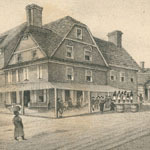 Philadelphia was a port of call in this exchange, and many of the pamphleteers gave copies of their work to the Library Company. Shown here are two examples of this transatlantic exchange. 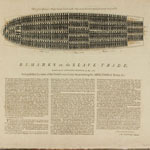 Remarks on the Slave Trade was published in 1789 by the Plymouth Committee of the Society for the Suppression of the Slave Trade. This dramatic and shocking cross-section of the slave ship helped mobilize British opinion against the trade. 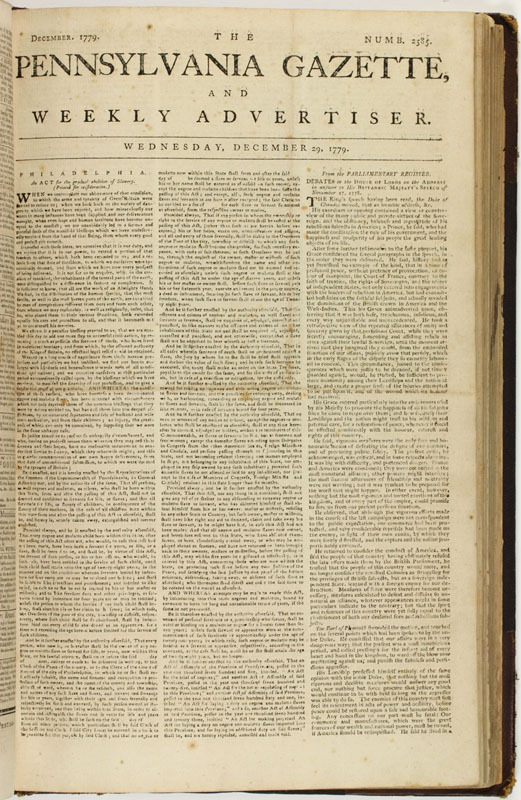 It immediately crossed the Atlantic and was republished the same year by the Pennsylvania Society for Promoting the Abolition of Slavery. Injured Humanity is another British import. The woodcuts illustrate excerpted text of the testimony against the trade before Parliament in 1791. 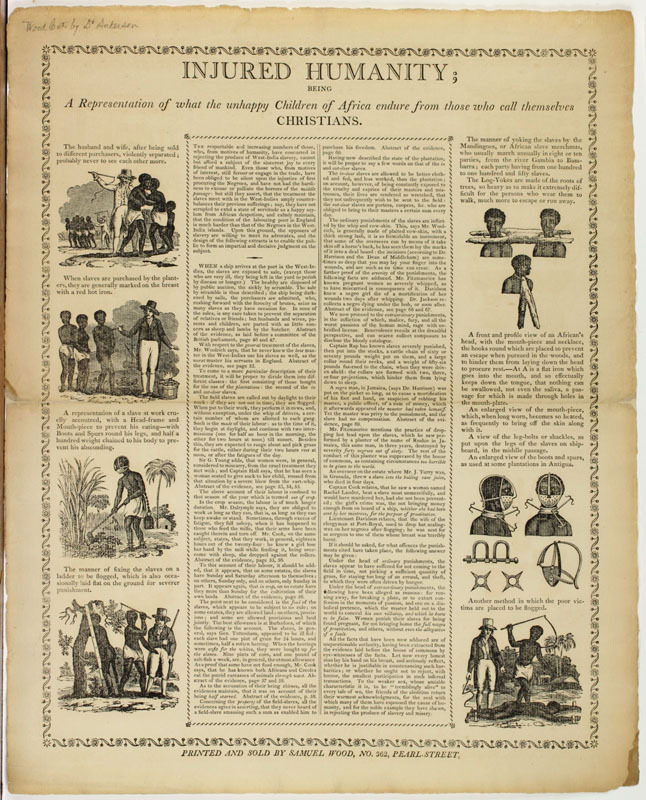 This version was published by the New York abolitionist Samuel Wood around 1805. These images were used repeatedly in antislavery literature throughout the remaining years of American slavery. William Elford, Remarks on the Slave Trade (Philadelphia, 1789). Injured Humanity; Being a Representation of What the Unhappy Children of Africa Endure from Those Who Call Themselves Christians (New York, ca. 1805). 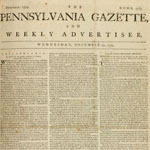 “An Act for the Gradual Abolition of Slavery,” in The Pennsylvania Gazette (December 29, 1779).